Over the Summer, eleven of us, ten teachers and one health visitor headed to Uganda for a few weeks. People do that kind of thing all the time. Going abroad isn’t new, in fact, reports on voluntourism actually point to some trips being detrimental to communities in developing countries. For years, I’ve been going to African countries. There’s a proverb that says it gets under your skin and it’s true. I developed a growing frustration though, with not being able to use and do what I’m best at. Sometimes people would realise I’m a teacher and then ask me to hang out in the nursery, which is fine, apart from I’m a secondary English teacher. I can cuddle babies and wipe noses and play peek-a-boo. It’s good for us to be out of our comfort zones but at the same time it’s good to use what we have in terms of training and expertise. That’s one of the reasons I set up DoubleMe; so people can increase, even double their impact by sharing the training that they’ve had. Eight years ago I went to Zambia on a schools’ linking project and got to speak to lots of teachers. They were talking about the challenges they faced and soon, I recognised a theme. Most of them had very little or no training at all and were expected to encourage huge classes to learn in order to pass exams. I remember vividly, sitting with a friend and saying, “What if it’s not the children we get sold-out on? What if it’s the teachers?” They can make much more of a lasting impression than someone going to visit a classroom for a few months or years. I came back, overwhelmed and almost paralysed into inactivity because I felt the weight and scope of the problem. I know I cannot enable a nation of teachers. We do not face the same problems, therefore, we cannot tackle the problems we do face with the same strategies. Something must be done though and even if I have a little part of the solution, I’m willing to put that forward. The plan with DoubleMe is to take our training and experience and to offer it with a great big serving of love. I’ve spent too long doing nothing, thinking and talking and now it’s time for action. Thinking and talking is necessary, it’s where the dream becomes a possibility peppered with ‘what ifs’ but without action it’s all hot-air. 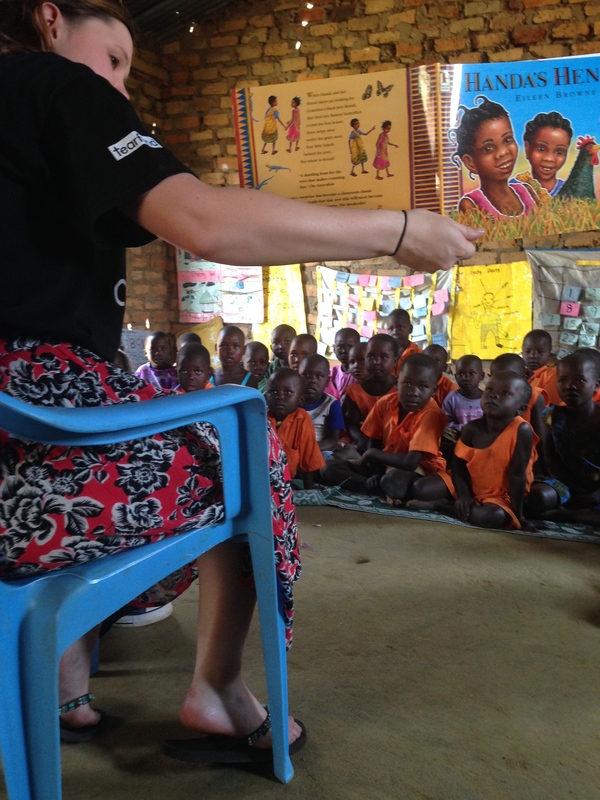 Over the Summer, as we spent time with the teachers we met, we realised how very different their lives are to ours. We talked about learning, behaviour, strategies, resources. We spent time in classrooms and for brief moments our minds jumped to what it would really be like to teach like this. With limited resources and training, with students who turned up tired and hungry. Late-comers were greeted with a gentleness that’s uncommon for such a crime in the UK. The teachers would explain, “Aaaah, she has been feeding her little brother as Mum is ill” or “He walks a long way to get here.” Our hard-hearts melted a little. Another part of the trip took us to Tororo where we met teachers from Mbula Primary and Apkor Nursery schools. They had very simple classrooms which were equipped with local resources such as bottle tops and nature displays on the wall. There weren’t enough classrooms at Mbula so students had lessons outside under trees with rafters of turkeys nearby. Peter, one of the teachers from the nursery school picked us up from our hotel in the morning to take us to school. It took me a while to realise, he was a night guard and then went straight from work to school. I don’t think he’s formally trained, however, it is easy to see he is a born teacher. As the bus pulled up, Peter got his bag ready and as he stepped off, he had children dripping off nearly every limb. They were chanting “Make-a-circle” which normally precedes songs or games. Peter, walked with them and started the days greetings and songs. I watched from afar, in awe. His challenges do not overcome him. He is able to be compassionate, caring and step into the role that awaits him every morning, tired from the night before. He possesses a dedication and humility that leaves me speechless. Our hosts looked after us extremely well and on one evening, we went for a meal with some of the church elders. We chatted about life in the UK and Uganda, laughed together at differences, shared our misunderstandings that reduced us to tears (of joy). Two of us were talking to one of the elders about the teacher training day we’d just had. We found teachers could sometimes be a little reticent or shy and were asking advice on how to get around this. He explained about the lack of training and how even formal training doesn’t prepare teachers for the classroom. For this reason, teachers might feel insecure about their ability as a teacher and therefore keep quiet until they feel a little more confident with us. I understood that. It makes sense. Then he said this, “What you need to understand, Ruth, is that if you are a teacher here, it means you have failed at life.” Stunned into silence again. Heart-broken a little more for these teachers who, we think have the best job in the world. The opportunity to impact, change, encourage, empower, support and love has been reduced to a role that holds little respect and pride. We joke here (I hope it’s a joke! ), about that saying, ‘Those who can do, those who can’t teach.’ It’s not true. Here or there. Teaching is a vocation, a ‘calling’ if you like. It’s such an honour to have young lives entrusted to your care as a teacher and it’s time that’s honoured with great training, enthusing and inspiring these teachers. Better teachers means better learners means better opportunities. Do you know, what I’ve found too, is that it also rubs off on UK participants. As we’re encouraging, we start to believe what we’re made for as teachers too. We start to be inspired to see change. We rekindle the fire that started in us for shaping and moulding young minds. You fill in the gap. If you’re ready to come with us on a trip, email hello@doubleme.org We’d love to hear from you. We’re hoping that this model of matching people in terms of their skills and expertise will also work with other professionals, not just teachers.